Hi. My name is Joey and I'm E-X-H-A-U-S-T-E-D!! What I do to keep up with toy trends, I tell ya. hahah Rough life but somebody's gotta do it, right? Toy Fair is held every year in NYC and it is HUGE! Every toy you can possibly imagine is out on display to be shown. With being 38 weeks pregnant...I had to be pretty selective in my short time there so I didn't get to see everything. With over 3 floors at the Javitz Center there were gazillions of toys to learn about and although I didn't get to see them all - I'd love to share with you some of the highlights. The big themes this year is Pop Stars, Angry Birds & girls' archery! Many of the companies had their own swing on bringing music and characters together. Known for their amazing and fun games has some great games on the horizon! They are bringing back an oldie-but-goodie with Mastermind Game. Plus some newbies on the way. A Skylanders Game, Trashies Game and more! Among the new Playmobil products on display was “Pop Star,” a line that hits stores in August that features a stage with working lights and sounds and allows children to connect an mp3 device to play music through the stage’s speakers as if the toys themselves were performing. Playmobil also has this amazing new Western Fort out this year. This fort will surely give your kids HOURS of pretend play! It comes with a working cannon, a flagpole and even a prison cell. Tons of fun for kids to really imagine themselves in the Wild West! These dolls are VERY cool! Mystixx by Playhut has come out with a new line of dolls called "Grimm". I loved these because of their details! They are 'animalistic' girls that have that fashion flair. Mystixx Zombies came out too. These are fun for the 'reality to fantasy' play with the dolls. Another new Mystixx toy I loved was the 'Mysfits - Different is Cool' pop and play dolls. They also have some other great scooters for the little kids coming out. The Kixi Kix 3-wheeled scooter, the Kixi Scribble 3-wheeled scooter that shoots chalk out the back end and more! Fun stuff from Razor out this spring! This is one of my favorite brands to work with when it comes to great items! Spin Master is really a plethora of goodies from games to gadgets! This year they are coming out with the coolest remote control gadget ever. "ZOOMER" not only acts like a real dog, but he totally listens to your commands! He actually rolls over when you tell him! Plus, he (ahem) lifts a leg to pee. It's hysterical!! It doesn't come out till the fall but it's sure to be a MEGA HIT! Zoomer will cost about $100. Hasbro is always a funfilled visit and this year was no exception! They actually step offsite from the actual Toy Fair because they have WAYYY too much ground and space to cover! This year, one of the trends at the Toy Fair was archery products for girls. Hasbro has a hot new line out called 'REBELLE' by NERF. It's some VERY hip 'girlie-bow-and-arrow-fun'. They also have a friend for the ever popular FURBY. They are called Furby Party Rockers. 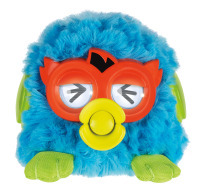 A smaller version of Furby with some funky - fun to go along with it. Approx $25 out this spring. Angry Bird Star Wars Battle GameAnother biggie that is a SURE win in my Angry Bird lovin' household is the really fun Angry Bird Star Wars Battle Games. We have one in our house and my 4 year old has asked that 'baby brother bring him one when he arrives'...so obviously we have some fans. What I love about these games is that they bring the VERY popular videogame to life. There are blocks, birds and pigs and you battle on with a launcher. Fun right? Mobo Tot with PushbarWith springtime RIGHT around the corner I completely fell in love with this insanely awesome product on the market! The Mobo Shift will surely draw attention when hitting the road with this bike. Bike? Trike? Heck I have NO IDEA what it really is. haha I love this product because it reminds me cruising on the boardwalk at the shore. And the fact that it has 3 wheels-you can TOTALLY 'cruise' versus getting an insane workout with a 2 wheeled bike. This cruiser is on the pricey side though. You're looking to spend approx $600 when you invest in this bike. For someone who isn't an avid biker, yes that is pricey-but if you are known for your outdoor investments then it's well worth it! I selfishly think of MYSELF with the Mobo Shift-but as a parent to a young child and one on the way-I LOVE their Mobo Tot with Push Bar. (NOTE: You can buy it without the Push Bar too.) I love this product because of the special spot for kids' to put their feet if they don't want to pedal. It comes in black, pink & ivory for ages 2-5. Approx $229. There are soooooo many honorable mentions that I plan to explore more throughout the year and share with you! Many of them aren't even out yet-so I have plenty of time to get you pumped up for their release.